Like little kids bursting with the secret their best friend just told them, we are so eager to share the entire story of our trip with you. We will talk about our time, our freedom, our activities; the list goes on and on! Where to begin…? Let’s start at the beginning. Day-by-day, we will tell the tale. The true start of our trip was weeks prior. It went on and on in our minds. The most common question: “Who will be my tent mates? !” Shaurya could be overheard repeatedly asking the same question of Mr. Underhill: “Who will my tent partners be? !” Mr. Underhill side-stepped each request with sly humor, to Ashmit’s delight. We packed our bags, and some of us even woke up on the day of the trip without an alarm. Finally, the day had come. On 6 February, we climbed the stairs of the bus for our highly-anticipated overnight trip to Kundalika. (Yes, it was truly awesome. Just ask us. We lived through it all!) It was like we had stepped into a world of utter chaos. People were eating, playing, fooling around on their cameras, and chatting away. It was a lot of fun. On the way, we stopped at the “Quick Bite” rest stop and enjoyed lemonade and watermelon juice. The teachers handed out reflection journals and we left the place with a joyful sing-along. Four hours and many twists-and-turns later, we arrived. Kundalika. Lunch was first on the agenda, and we had to eat with continued suspense over learning our tent mates. (Teachers can be so cruel, making us wait.) The teachers conferred, and our tent mates were announced. Pure joy! Off we went to our tents to get settled. After settling into our tents, we were sorted into teams. We explored the camp, created and presented colorful maps and team flags, and moved on to our most-awaited activity of the day: kayaking. It was a trek to the river from camp. Down the mountain we strode, to arrive at the lake water’s edge. Lifejackets on, we partnered into pairs and got into the kayak two-by-two. We took turns kayaking and swimming and learned patience and peace. Boredom isn’t bad; when you have nothing to do, you come up with the most amazing things! (How else did Mozart compose his tunes?) You should have seen the mud. Up the hill we hiked, and the sun soon set. We settled in at 9:30, talking gently into the night among friends. A whole day of discovery lay ahead. The morning chill at 6:30 a.m. kept us under the covers. Waking up with friends was fun. We played UNO and other games, followed by a bountiful breakfast. The highlight of the day would soon begin; we were ready for rafting. A short, steep trek brought us to the riverside where we swam and splashed as we waited for the rafts to arrive. On the rafts, we took turns and learned the language of rafting commands. It was soon time to leave shore. The temperature was rising and we were ecstatic. We simulated emergency raft flips: 3-2-1, we splashed into the cool water. After climbing onto the overturned raft, we practiced flipping again. WHOOSH! This time we knew what to expect. We were dry in no time and then created our own rafts from two tubes, some bamboo, and rope. 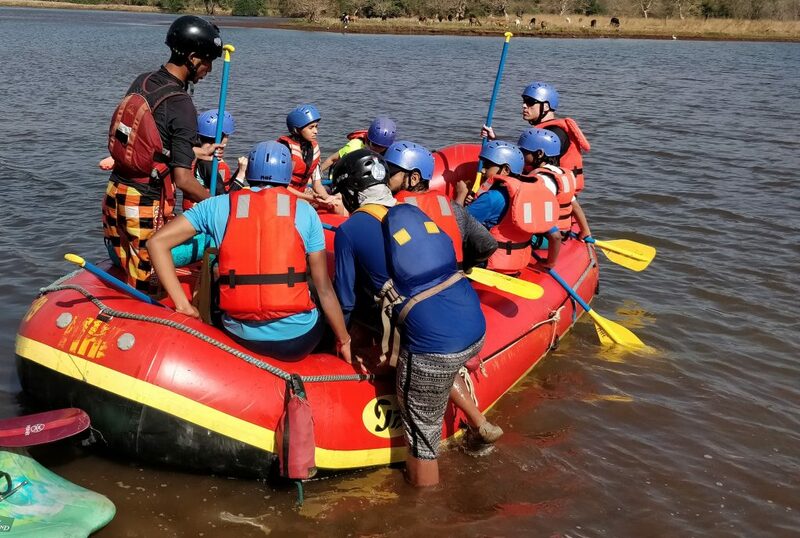 Priyanka, Isabella, Amaira, Ayush and Armaan’s raft rode beautifully while some rafts were sinkers. 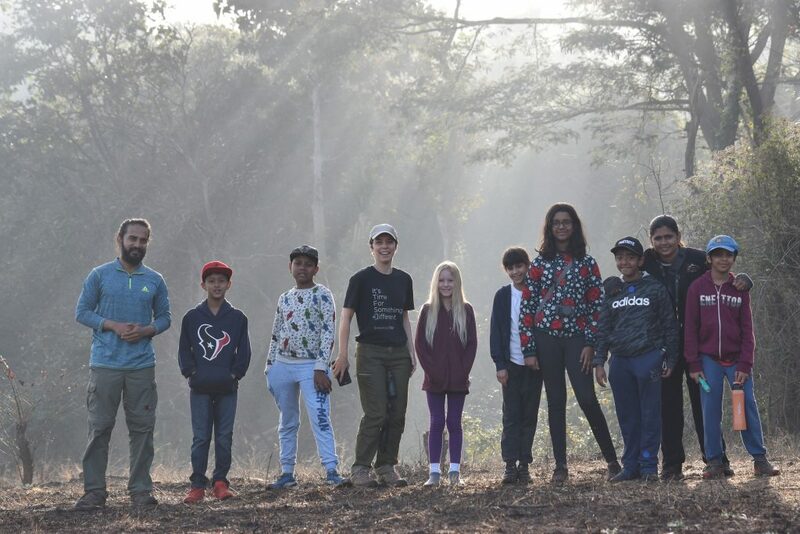 Following our return trek to camp and time to refresh, we were off to zip-lining and the Burma bridge on the high-ropes. In the forest clearing, we partnered to create collages about global warming using everything around us. (We could not pluck leaves from plants, of course, as it would contradict our inquiry.) There were quite creative interpretations of why we needed trees, models of the reasons for global warming, and cycles of time. We were hungry and it was time to cook. Jungle cooking! In four groups, we combined our ingredients to make whatever we wanted. Aaryan’s group made rice paprika and Armaan’s group made a dish called Sea of Diversity, with a presentation like a sea with islands. Smit’s team made mountains of rice fun. Ayush’s group made fried rice. And then we ate (other food)! The sun set and we were ready for a night trek. The first thing we encountered was a toad. We gave it a brave, gentle touch. And then the best part: We closed our eyes, faced upwards, and then opened them. The sky was beautiful. It was dotted with loads of stars. We saw the nearest galaxy, learned about the Orion constellation, and located Polaris. Out of the darkness shot a shooting star, and we watched in awe as it streaked across the sky. It was a sight to be seen. Around the bonfire we roasted marshmallows and were soon to bed, dreaming of home. The morning dawned and we had a spectacular bird-watching trek. It was an adventure in the morning light, inspired with termite trails up trees and red ant nests nestled high in branches, elusive birds calling out and the sounds of squirrel wars. Back to camp and it was back to team games: Save the World and Pipes and Marbles. During Save the World, teams darted to numbers scattered all around to step in sequence from one to fifty. “Don’t go on two consecutive numbers!” And on to Pipes and Marbles, with teammates passing marbles along pipes cut in half. It was hard to keep the marble from falling! Strategy. The potential energy of the still marble quickly turned to kinetic energy in its fall. We learned that if there was no loser there would be no winner. After freshening up, we had lunch, packed our bags, took a photo, and were on our way home. Singing songs once again ensued on a bus ride full of bumps and twists, taking turns with friends’ faces asleep, and soon the large blue gates of school were opened and parents were all around. Home again.